This is a simple introduction to crafts using Plaster Of Paris. In this project, you will use your choice of soap, candy or candle molds to make unique air fresheners that rely on gentle air flow to dispense a pleasing fragrance. Try hanging one of these in your clothes closet, or in your car, to freshen the air with the pleasing scent of your favorite liquid potpourri or essential oil. 1. Follow the directions on your supply of plaster of paris to make or use the plaster, then pour into your mold, making two of the same mold. Let dry overnight then pop out both of the dried plaster of paris molds. 2. Paint one side of each mold all over, in your choice of colors, using pearl or regular acrylic paint. 3. Paint most of the back of each molded piece as well, in any color of your choice (this area will not be visible on the finished piece) – but you MUST leave unpainted a certain section at the top back to absorb the liquid potpourri or essential oil later. Once the paint is dry, brush on a matte or gloss finish sealer over the painted areas only. 4. When both molds are dry, use an eye dropper or old medicine dropper to add a few drops of liquid potpourri or essential oil to the unpainted section on the back of each mold. It should be absorbed by the plaster quite quickly. 5. Cut a length of thin ribbon, cross over the ends, and glue to the back top of one mold. Add more glue to the back of both molds, then push them together tightly so the seams are together. Let dry. 6. Make a tiny ribbon bow and glue this to the top of your air freshener, directly in front of the ribbon. 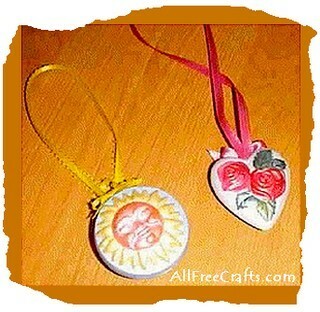 Now you have a scented air freshener to hang in the car or in your closet. Enjoy!